Birthdays and celebrations will now be more spirited as you present food stuffs, pastry and cakes in the most whimsical way with this cake stand. 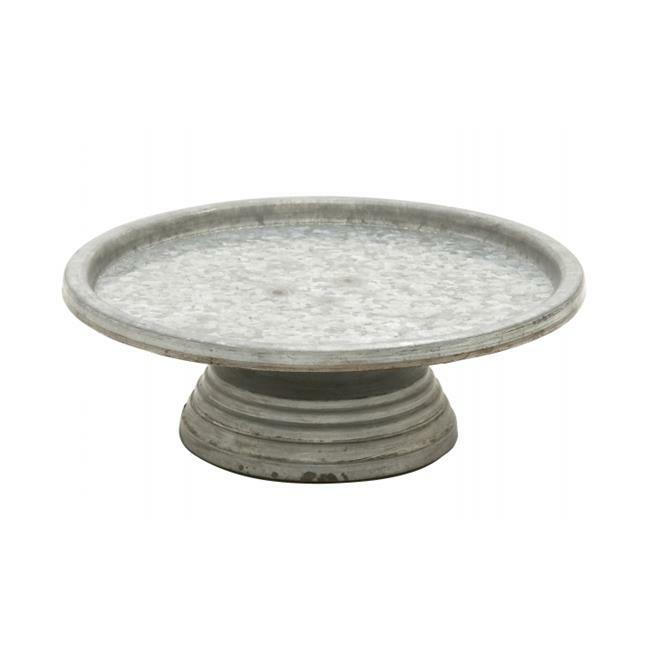 Graceful in looks, this stunning cake stand is made of good quality metal. It has a distressed Grey finish and a round flat rimless platter. The pedestal features a ribbed pattern and offers good support to the plate above which helps you display a cake in height. With this cake stand you can display cake in the most elegant way to guests and friends. With this cake stand you will definitely score a total in presentation while hosting a tea party. Durable and sturdy, this cake stand will be in prim condition or years together. Apart from holding cakes, the stand can be used to hold wine glasses, cups and saucers. It can also be utilized to display fruits in the center of the dining and center table. Indeed a useful stand, run to grab it today!